Parents of children affected by meningitis B have told MPs a vaccine for the disease should be extended to all UK children up to the age of 11. They say the cost of treating survivors left with life-long disabilities more than outweighs the £75 vaccine price. Currently, the meningitis B jab is routinely given only to infants in the UK. The government's advisory committee says offering it to more children would not be cost effective for the NHS. But nearly 823,000 people have signed a petition calling for the NHS immunisation programme to be widened. It was set up by Gateshead father-of-two Lee Booth after one of his daughters was refused the vaccine on age grounds. It is now the most signed in parliamentary history. He told the Petitions Committee meeting: "What price do you put on a child's life at the end of the day? We have got a vaccine out there. We should be using it." The petition saw a spike in support after one mother, Jenny Burdett, publicly shared a photo of her young daughter dying from the infection. Image caption Two-year-old Faye Burdett died from meningitis B. Two-year-old Faye Burdett, from Kent, died in February, after an 11-day battle with meningitis B.
MPs on the Commons health and petitions committees will listen to evidence from interested parents, charities and government advisers, with a further session next Tuesday. 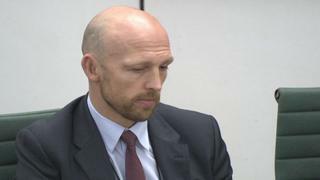 They include Faye's parents, Jenny and Neil, and former England rugby captain Matt Dawson, whose son survived meningitis. Claire Timmins lost her son Mason to meningitis B. She told the BBC: "Anybody can get meningitis B, not just babies. Mason was seven, adults can get it. It's important children are vaccinated against it. What price can you put on a child's life? "We need to carry on the fight for all those children who have lost a life or suffered." Meningitis B most often affects children aged under one and this is why experts say they chose this group to be routinely immunised - they wanted to protect those at highest risk. The NHS programme started on 1 September, with the jab offered to infants at the age of two months, with a further dose at four months and a booster at 12 months. There was a one-off catch-up campaign for infants who narrowly missed out. By May 2017, all UK children under the age of two years will have been offered it. The vaccine is also available for a small number of older children and adults who are at increased risk of infection, such as those with no spleen. The Joint Committee on Vaccination and Immunisation, which advises UK health departments, considered vaccinating older age groups (one to four-year-olds) but concluded it would not be cost-effective. It also considered a programme for adolescents but said that further research was needed. Dr Helen Bedford, senior lecturer in Children's Health at University College London, said the guideline on who should receive the jabs was not set in stone, but as the vaccine was rolled out across a generation of infants, experts would start to learn more about its overall effectiveness and its cost. She said: "It's a hard decision, nobody wants to deny a child protection against this disease, which is devastating. "We have got a limited pot of money in the NHS, you have to make decisions about where you are going to spend that money. Clearly, if you have a group that are so much more at risk than another group, that's where you are going to get the best value for that money." A Department of Health spokesman said: "We understand people's concerns and all vaccination programmes are kept under constant review but we have to be guided by the very best scientific advice and we will continue to protect the children who are most at risk." Charity Meningitis Now says there is enough evidence to support immunising children under five. There are 12 known groups of meningococcal bacteria, and group B (meningitis B) is responsible for about 90% of meningococcal infections in the UK. About 26% of these cases occur in the first year of life and 59% in children under the age of five. Meningitis B is fatal in about one in 10 cases - and about one in four of those who survive is left with long-term problems, such as amputation, deafness, epilepsy and learning difficulties. Parents can pay privately for the vaccine, but there has been a shortage of supplies.